From Munnar our plan was originally to grab a bus back to Cochin and then snag a train to Alleppey where we would sort ourselves out a backwaters houseboat tour. In an act to save some time, we instead decided to get a driver to taxi us from Munnar, directly to the much hotter, much more humid coast of Alleppey/Aleppuzha. We did this instead of bussing it from Cochin to Munnar as well and it seemed to make life much easier. The journey out of the mountains however, was, putting it mildly, an absolute nightmare. We had the worst driver. He honked at literally every car he passed/passed him (and I do mean literally). Everyone honks in India. It should be their national anthem. But this dude went above and beyond. OK, that was annoying, but not life-threatening. Basically, this guy’s main driving tactic was to drive as if you’re playing an endless game of chicken. Drive on the wrong side of the road every opportunity you have directly at oncoming traffic. On narrow, windy mountain roads. When we got to the main road along the coast from Cochin to Alleppey, I though, OK, things will get better now – no more windy roads, this is kinda-sorta a proper dual-carriageway. Well, my nausea finally went away, but my nerves were wracked even further. This guy! He was clearly terrified on driving on a non-country road and this road had crosswalks and every time he came to a crosswalk (and there were many) I swear first he would speed up a bit (like when you’re trying to beat a yellow light) but then he’d chicken out and come to pretty much a screeching halt ON the crosswalk. It was unbelievable. Worst driving I’ve ever experienced. Possibly the worst 4 hours in a car, ever. And no doubt I’ll soon see him again soon driving a taxi in Dubai. We didn’t even have him take us all the way to our accomodation in Alleppey, because it was just too terrifying. We got out as soon as we could in town and then walked until it rained, then caught an auto-rickshaw the rest of the way. Alleppey was OK. One thing I had noticed through this point was that India was far, far less foreign and exotic than I was hoping and was expecting it would be. Sure, the greenery and flora and fauna is a world away from the UAE’s, but the towns – Munnar, Alleppey, and quite likely the more modern bit of Cochin which I avoided, did not seem all that different from Dubai to me. This was a disappointment. Of course, the India we were seeing was nothing like the futuristic skyscrapers and ultra-malls of Dubai that most people are familiar with, but it was very reminiscent to the neighborhoods of Dubai that I had been residing in for the past 3 years (Satwa/Bur Dubai/Karama/Deira). And granted I find these areas interesting, but I don’t want to visit them when I’m on vacation. So that was a bummer. Thankfully we didn’t really come to Alleppey to experience it. 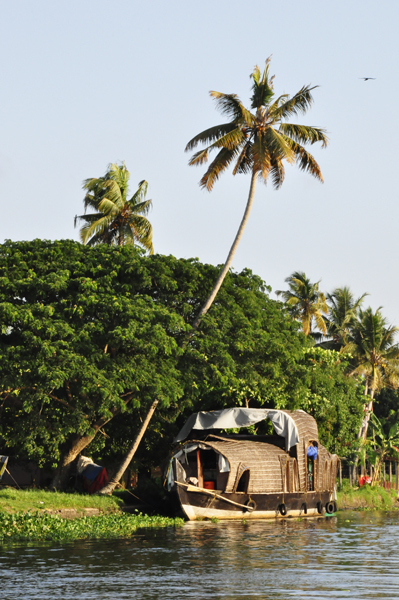 Our intention was to spend a day/night on a houseboat and tour the backwaters and then get out immediately after the backwater tour. I can’t find much to say on the backwater tour. 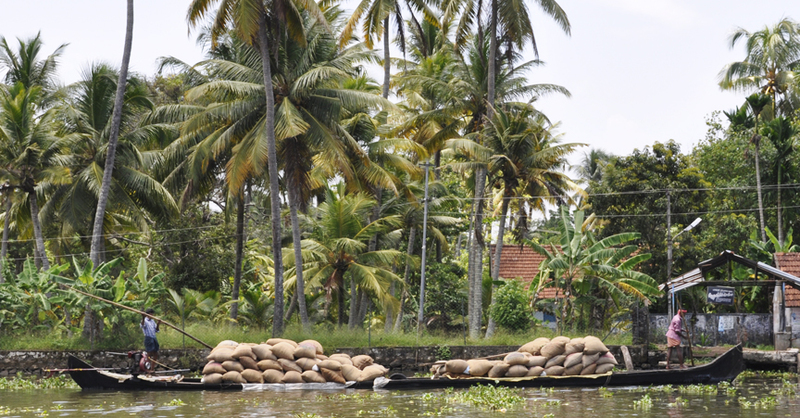 Everywhere you read that the houseboats tours are the can’t-miss thing to do in Kerala. 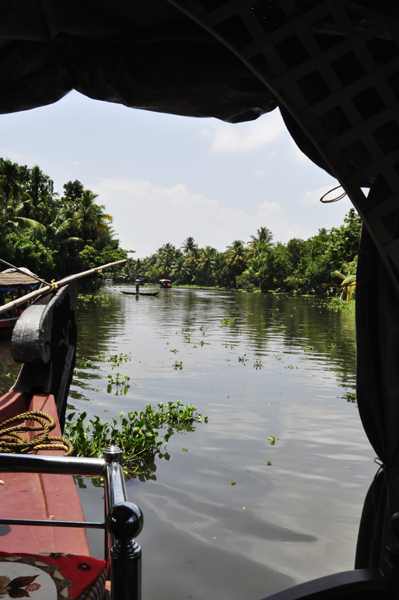 And while it was certainly good, I wonder if there wasn’t perhaps a better way to really explore the backwaters? The 1-bedroom houseboat was nice, but don’t come looking for luxury (although I think in some of the bigger 4 or 5+ bedroom models the lux factor is heightened). It was certainly a relaxing way to spend 22 hours (check in ~11:30am; check out ~9:30am) – just moseying along slow waterways covered by far-reaching palm trees. Passing by little villages and watching the daily life go on there, such as clothes-washing and bathing in the murky waters (clean!) that was seriously full of prehistoric-sized prawns (terrifying!). Drinking some booze, eating some freshy-prepared curry. There wasn’t much you could complain about. The thing about it that kind of irked me, was that instead of docking the houseboat for the night in the lake feeding the backwaters (which apparently is not allowed so that the fishermen can properly utilize the lake in the evenings – fair enough) or at some other interesting location – nope, it was docked at exactly the same place we set off from. We were informed that this was a new(ish?) policy and houseboats may only dock for the night in their given parking space, basically. I did not know this in advance, but had I, I think the better option would have been to simply rent the houseboat for the day. 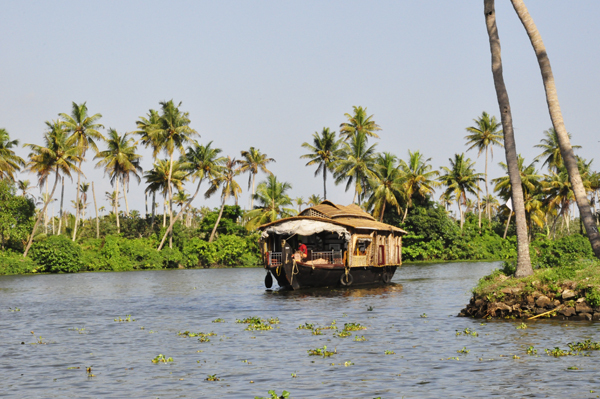 Or even just rent a canoe and paddle through the backwaters myself. I certainly do not think I’d want to do the houseboat tour during high season, though. We were there in low season and it was busy enough, I can only imagine the amount of traffic on the water during high season. After unloading from the houseboat we began to head towards the train station where we assumed it would be easy to hop on a train and get to Varkala (as it’s on the line to Trivandrum). Ended up, I wrongly assumed that bit and the next train with a stop to Varkala wouldn’t be until mid-afternoon. Ugh. I did not want to stick around Alleppey that long, so the solution was to snag a bus. Also easier said than done. Where do we get the bus? Oh – just over there – we were told. NOT HELPFUL. So far in India, everywhere and everything was in English. Shop signs, menus, road signs – I mean it, everything! But how about the buses? Nope! Only Malayalam. Unfortunately I can’t read curly-ques and scribbles so confusion instantly ensued. Eventually – after about an hour – we did finally make it onto a bus that stopped near Varkala (in fun-to-pronounce Kallambalam) along with a few other equally-confused western backpackers also trying to find their way there. Another somewhat less-than-enjoyable journey. No air conditioning (not a shock), no available seats, breathing 99% fumes & 1% oxygen (from this evening I lost my voice for a couple days and I mostly blame this fume-breathing), a few more games of chicken over the next few hours. 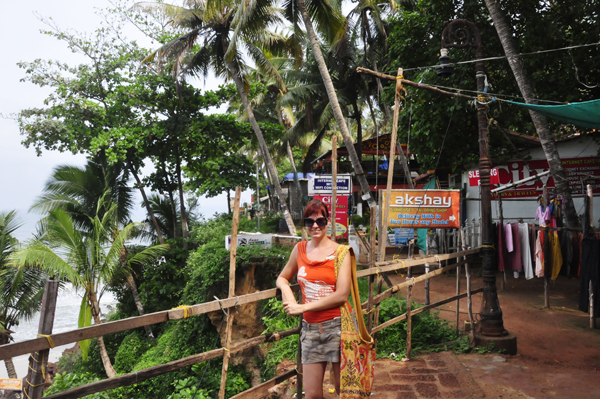 After which we jumped into the most annoying autorickshaw ever to make it the rest of the way to Varkala beach. If you get in an autorickshaw and you want him to take you to somewhere to find accommodation, don’t let him know that you’ve yet to book a place. You will rue the day. Simply pretend you’ve booked “x” hotel and just have him take you there. These people apparently get commission from certain hotels if they drop you off there and you book a room, so if they realize you’ve not yet booked a place, you will be incessantly hassled to stay somewhere they get commission until you pretty much have to start screaming at the driver to shut up, turn around, and drive to where you want them to. Thankfully, after this, we didn’t have to deal with any more taxis or rickshaw drivers for a week, because once we got to Varkala, we simply planted ourselves there. By the time we got to Varkala in May, it was, like everywhere else in Kerala, low season, but unfortunately in Varkala this meant that a decent number of the shops, restaurants and accommodation were closed until autumn. This was a shame (the place I had really been looking forward to staying in ended up being closed) but the spot was still nice. And I finally felt like I was somewhere foreign. Parts of Cochin, Munnar, and Alleppey all reminded me of Dubai in ways, but hippie backpacker chilled out Varkala certainly did not. While long-time travelers through the country referred to Varkala (& Goa) as “a vacation from India”, I finally, properly felt like I was in another country that wasn’t the UAE. 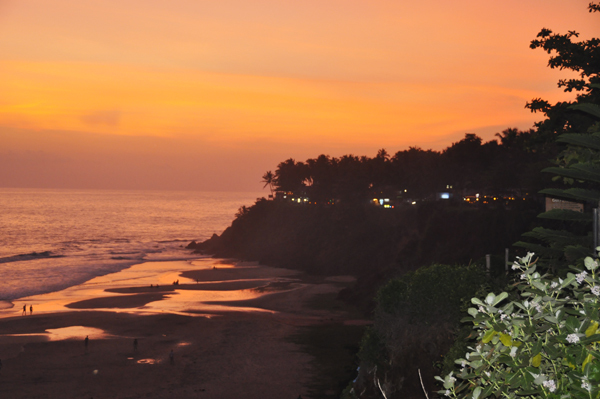 In need of some relaxation, we eventually decided to simply spend the second and final week of our holiday in Varkala. Sure, it was pretty quiet due to much of it being closed. But enough was open to keep us entertained (although I think I drank the town out of the last of their white wine), we had met few travelers that were enjoyable to get to know during our stay there, and the cafes and beach were prime book-reading spots. I finally finished David Foster Wallace’s brute of a book, (but still very good) Infinite Jest! If nothing else, at least I accomplished that on this holiday. Varkala’s palm-fringed cliffs with steep steps leading down Papansam beach are the very definition of a tropical postcard, and in the evening the cliff’s cafes and lounges lit up the clifftop with a (slightly) more exciting atmosphere. 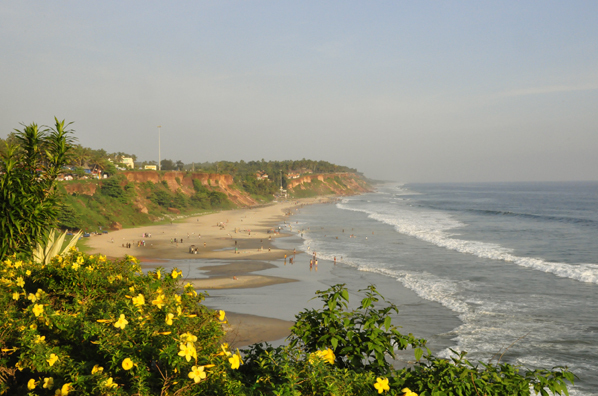 On the downside, the Indian ocean at Varkala’s Papansam beach is noted for its strong currents and dangerously strong rip current. Immediately upon getting into the water, the current makes itself known and is possibly one of the strongest currents I’ve ever encountered. Thankfully I didn’t have any run-ins with the rip current, but this was usually marked on the beach with red flags so that you could steer clear of it. Sadly, on the morning of our final full day in Varkala and India, I noticed a great deal of people lining the clifftop and down at the beach (so many in fact, we decided against going to the beach that morning). 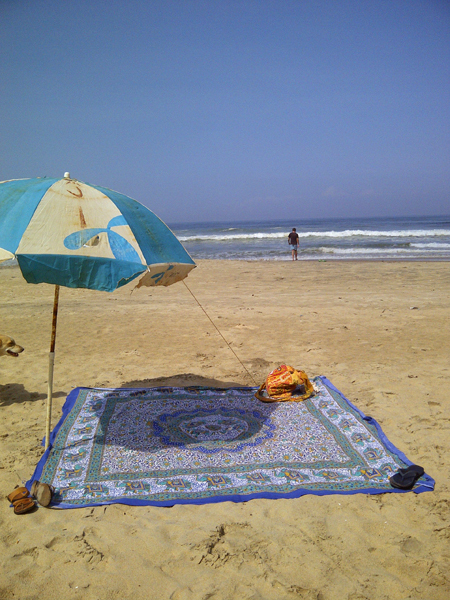 I assumed it was maybe a holy day (one side of the beach was always full of people performing religious – Hindi – rites). Eventually I learnt that a boy had gone for a swim that morning but got pulled out to sea by the rip current. The search was on for his body all morning, hence all the morbid gawkers. The boy’s body was eventually found late morning, and it was all extraordinarily sad. 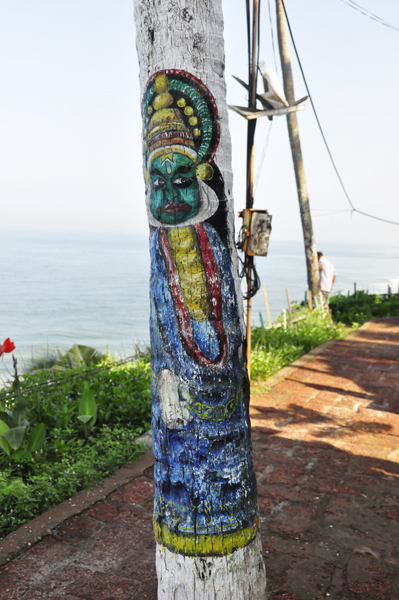 That current is clearly no joke and something to be wary of when in Varkala. The low-season visit to Varkala has definitely piqued our interests however, and we’re hoping to be able to visit again this autumn for a weekend during high season (birthday fun in November, perhaps?) to see what it’s like when the party is in full swing. And apparently there is some quality partying going on there during the in-season. Fingers crossed I’ll find out! And that was that, with the exception of the tedious Trivandrum airport. Hated it. So, now I’m faced with a stretch of boring old quiet Dubai summer ahead of me. For months. No more major travel plans until autumn (although nowhere exotic, to my dismay) and currently only have a long weekend in England planned for late summer. Coincidentally, over Labor Day weekend. So HAH, I’ll finally have myself a Labor day weekend off again for once!